Learning how to cook ham steak is essential if you are alone or have a small family. You can still enjoy that wonderful flavor of ham without having such an abundance of leftovers. Actually when cooking the ham steak you are getting the prime section of the whole ham. Because of the cut of the slices, any seasonings added are able to be absorbed all through the steak. When you learn how to cook ham steak, you will also learn of the many delicious glazes, sweet fruit toppings and sauces which blend so well with the steaks. Some of these toppings are simply spooned on top of the ham steaks when serving. Other sauces, sometimes with vegetables included are spoon on the cooked ham steaks and bake for a short time in the oven before serving. When you learn how to cook ham steaks you will see the choices are endless. Trim excess fat and tough brown skin from the meat. Make several small cuts around edge of fat to prevent curling. Spread top side with mustard. Preheat broiler with pan in position for 10 minutes. Place meat on pan 3 ½ inches below heat. Broil ½ inch thick steak for 10-12 minutes; broil ¾ inch thick steak for 15-17 minutes; broil 1 inch thick steak for 22-24 minutes. Turn steak over once during cooking. If the ham steak is precooked, only broil the ham slice about half the time. The following is how to cook ham steak in the oven. Wipe ham with a damp cloth. With knife make several small slashes in the fat around the edge to prevent curling. 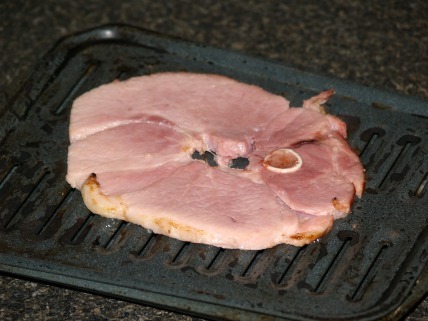 Place the ham steak in a shallow baking pan. Mix together honey, juice, sugar, peel and mustard. Spread half of mixture over ham steak. Cover top of pan and bake for 35 minutes. 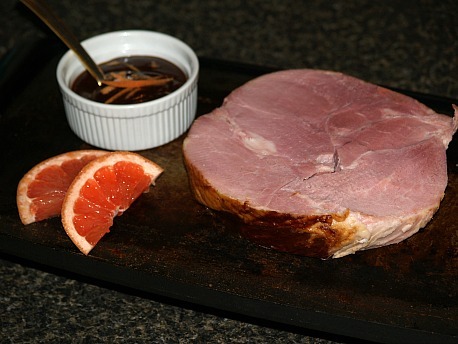 Remove ham from pan and spread with rest of orange mixture. Place under broiler for 5 to 8 minutes until slightly brown; remove to platter and keep warm. Pour liquid from baking pan into a 1 cup measure. In a small saucepan combine cornstarch with the 1 cup liquid. Cook until slightly thickened and pour over ham steak. When you learn how to cook ham steaks, this sweet soup taste blends well with ham. Brush ham steaks with oil and broil for 5 minutes. Turn steaks over, brush with oil and sprinkle each with teaspoon brown sugar. Broil until sugar melts and caramelizes. To make sauce drain juice from pineapple into measuring cup; add enough water to make 1 cup. Heat oil in saucepan; add onion and sauté until tender. Stir flour into onion mixture and cook 1 minute while stirring. Stir juice mixture, soy, vinegar and ketchup into flour mixture. Cook and stir until sauce thickens; stir in pineapple chunks and black pepper. Pour sauce over broiled ham slices; cool and refrigerated overnight. Preheat oven to 350F degrees; place ham and sauce in ovenproof dish. Bake until hot and bubbly about 30 minutes; serve with cooked rice. Place ham slice in shallow dish; combine and blend remaining ingredients and pour over ham. Place on grill or under broiler; cook 25 minutes basting frequently. Turn ham over and cook 20 minutes loner while basting. Remove from heat and serve with grapefruit sauce. Combine and blend sugar, cornstarch and salt in saucepan; gradual add water and grapefruit juice. Stir and cook over low heat until mixture thickens and comes to boil; reduce heat and simmer 1 minute. Remove from heat and stir in grapefruit pieces. Brush ham with oil and place under preheated broiler 4 to 5 minutes on each side. To make sauce cook cucumber in salted water 3 minutes drain and dry with paper towels. Melt butter in saucepan over medium heat; stir in flour. Cook over medium heat for 1 minute stirring constantly; gradually stir in milk. Bring sauce to a boil; reduce heat and simmer 3 minutes. Add and stir in sauce cooked cucumber, cream and chives. Season with salt, white pepper and cayenne pepper. To serve spoon sauce over ham pieces.